Source Optimized DNA sequence encoding Human EPO mature chain was expressed in CHO cells. Molecular weight Nativehuman Erythropoietin-alpha is generated by the proteolytic removal of the signal peptide and propeptide, the molecule has a calculated molecular mass of approximately kDa. Recombinant EPO-a is a glycosylated disulfide-linked homodimeric protein consisting of amino acid residue subunits, and migrates as an approximately kDa protein under reducing conditions in SDS-PAGE. Biological Activity Activity was determined by the dose-dependent proliferation assay using a factor-dependent human erythroleukemic cell line TF-1 and was found to be.8x105 IU/mg. Presentation Recombinant Erythropoietin alpha was lyophilized from a.2 μm filtered PBS solution pH. 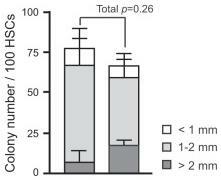 Effects of overexpression of Bmi1 on HSCs in vitro. Single CD34-LSK cells were sorted into 96-well microtiter plates containing the SF-O3 medium supplemented with 10% FBS and multiple cytokines (10 ng/ml SCF, 10 ng/ml TPO, 10 ng/ml IL-3, and 3 u/ml EPO) and allowed to form colonies. The effects of SNS-032, perifosine, or combination on the leukemia colony formation (CFU-L) in methylcellulose medium were examined using leukemic colony assay as previously described [3) in 600 μL of methylcellulose solution were incubated in the presence of the agents or an equivalent amount of medium at 37°C in a humidified atmosphere with 5% CO2. Primary leukemic cells were cultured in methylcellulose medium containing recombinant human (rh) stem cell factor (SCF), granulocyte macrophage-colony-stimulating factor (GM-CSF), and interleukin 3 (IL-3) at 2 × 104 cells/dish. After 7 days, CFU-Ls that contain >40 cells were scored manually under a light microscope . For colony assay of human normal bone marrow cells, 3 U/mL rh erythropoietin , 50 ng/mL rhSCF, 30 ng/mL rhGM-CSF, and 10 ng/mL rhIL-3 were added to the methylcellulose medium. The colonies were counted under a microscope on day 12 of culture. celltype'>Leukemic cell lines, MNCs from the patients with, or healthy controls were infected with or without the indicated viruses (50 MOI) and seeded in triplicate in a mixture containing 1.35% methylcellulose in medium'>Iscove's medium'>modified medium'>Dulbecco's medium (IMDM;) supplemented with 20% fetal bovine serum and10−4 M 2-Mercaptoethanol . For colony assay of bone marrow cells, 3 U/mL recombinant human (rh) erythropoietin, 50 ng/mL rh stem cell factor, 30 ng/mL rh granulocyte macrophage–colony-stimulating factor, and 10 ng/mL rh interleukin-3 were added to the methylcellulose medium. The colonies were evaluated under a microscope on day 12 of culture.